SUBLEVEL203.com: “If one were to attempt to take the entire essence of Projekt’s artists and try to condense it into one simple disc, you would have Projekt: Gothic a brilliantly constructed CD showcasing the prime artists on this darkwave and ethereal label. Sequenced by Projekt’s Sam Rosenthal for the Hot Topic chain, for the 2002 holiday season. A note from Projekt’s Sam Rosenthal: For the 2002 holiday season, the Hot Topic chain asked me to put together a special budget-priced compilation focusing on the ethereal/darkwave side of the Projekt label. 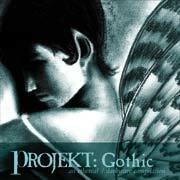 It was fun to listen through Projekt CDs that I have not heard in a while, searching for the perfect songs to capture the label’s Gothic side. Included on Projekt: Gothic is Unto Ashes’s cover of Blue Oyster Cult’s “Don’t Fear the Reaper,” recorded especially for this compilation, as well as classic tracks from Voltaire, Attrition and Lycia. Subtitled “an ethereal/darkwave compilation,” this disc is an introduction to the label and to the genre of music that Projekt defines so well, as well as a beautifully designed and selected overview for those who have been with us for a while. This is the upbeat and more rhythmic side of Projekt, a striking overview.